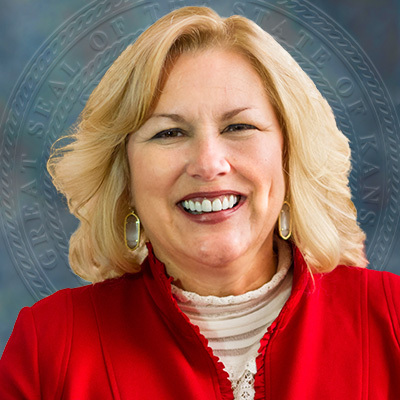 Kansas Department for Children and Families (DCF) Secretary Gina Meier-Hummel was appointed on Nov. 22, 2017. Prior to serving the agency, she was the Executive Director of The Shelter, Inc., for two plus years. The Shelter is a nonprofit organization focused on crisis intervention for at-risk youth in Douglas County and Northeast Kansas. Before that, she worked as the Commissioner of Community Service and Programs for the Kansas Department for Aging and Disability Services (KDADS). She also served at DCF as the Director of Children and Family Services in the Prevention and Protection Services (PPS) division, from 2011 to 2013. Earlier in her career, Secretary Meier-Hummel worked 13 years at KVC Behavioral Healthcare, one of the state’s two current foster care contractors, in multiple roles and at the Department for Social and Rehabilitation Services (now DCF). She started her career conducting child protective service investigations. Secretary Meier-Hummel has served on a variety of boards and task forces, including as a member of the Child Welfare Task Force, Commissioner of the Governor’s Mental Health Task Force, Chair of the Governor’s Subcabinet on Behavior Health, a member of the Social Services Policy Council, as well as on the steering committee for KanCare. She holds a Master’s degree in Clinical and Administrative Social Welfare from the University of Kansas.